The original Pebble Steel Smart Watch. The Pebble Steel integrates with your life to connect you to what matters most. The Pebble Steel Smartwatch connects to your iPhone or Android device via Bluetooth so you get the information you need exactly when you need it. Designed to make your life easier, Pebble provides personalized notifications and downloadable apps to keep you in the loop when you’re on the go. You can also customize with watchfaces and apps to suit your personal style and interests. It features a long-lasting battery, user-friendly operation, and a screen that’s readable even in bright daylight or underwater. Pebble comes with a USB charging cable and Quick Start Guide. 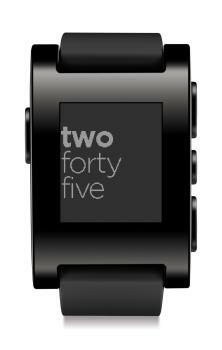 Pebble has a straightforward, wearable design that lets you get the information you need in just one glance. The e-Paper display is easy to read even in direct sunlight so you can always see what’s going on inside or out. Lightweight and comfortable to wear, Pebble won’t weigh you down when you’re on the move. It’s 5 ATM salt or fresh water rating means you’ll still be accessible if caught in a downpour or swimming, and the scratch-resistant display can take some hard knocks while keeping its good looks. The battery conveniently lasts five to seven days on a single charge.